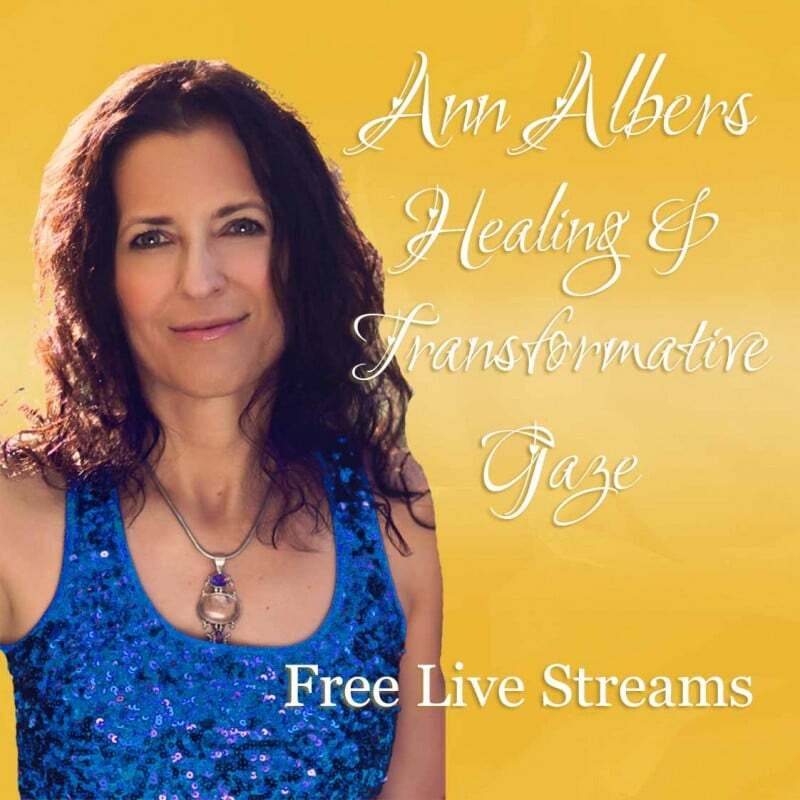 Ann Albers talks to angels. She shares their love, wisdom, and healing energy in private sessions, classes, and with an online global community. She loves to help you awaken your natural intuitive abilities and learn to live in partnership with your own angels! 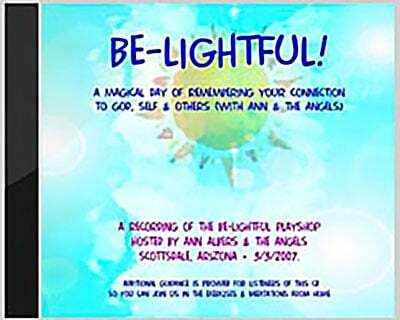 Ann is a true messenger of God & a clear spokesperson for the angels and ascended masters. Please note: Ann’s wait list for new clients is over a year right now. Ann works with angels and your loved ones who have crossed over to help you heal, uplift your spirit, and give you the information you need to make happy, healthy, life choices. If you are a prior client, you can contact us to schedule and Ann will get you in as soon as possible. Ann is accepting new clients at this time, however, the wait list is typically over a year. Please contact us and we will get back to you as soon as possible to confirm you are on our list. If you need to see someone sooner, we can offer you a list of Ann’s personal favorite referrals here. To read more about Ann’s readings, pay for a reading that is already scheduled, or make a donation for any assistance you have received in other ways, you can access our payment page here. Please do not pay for a reading unless it is already scheduled with Ann. An angel reading is simply a conversation with Spirit. I am like a radio that can tune into your angels, loved ones, pets, and anyone else – living or deceased – who might be helpful in giving you love, information, wisdom, or guidance. I say a prayer, allow the angels and loved ones to say whatever they feel is important, and then create time for them to answer your questions. Sometimes the angels move energy if they feel that will assist you in your life. Predictions… The angels can, and often do, tell you where your life is headed. They constantly remind us that predictions are just an indication of the direction you are currently heading, given your energy and current choices. The angels know that you can change anything in your outer world if you are willing to do the work to change your inner reality. Coaching from Heaven… The most powerful transformations in readings often occur when the angels work with you to help you create inner conditions that will lead to a happier, healthier, and more abundant life. They guide you to deep, long lasting solutions to life’s challenges and help you develop new attitudes and habits that will create a more heavenly reality. Read what former clients say here! I’ve worked with people from all different ages, races, belief systems, and walks of life. My youngest client was six years old (unless you count the babies in the womb that I’ve conversed with) and my oldest was 104. I’ve read for children, students, house wives and husbands, corporate CEOs, clergy, entrepreneurs, famous entertainers, healers, psychics, retired people, and others from almost every profession imaginable. I read for those who believe and those who want to believe. Most people come for readings for one of three primary reasons – to solve life challenges, communicate with deceased loved ones, or for help in creating change in some aspect of their lives. Many come during times of loss, transition, or when they are inspired but don’t know the next step. Some come simply for a “tune up” or “tune in” and a few come simply out of curiosity. The more help or communication you want to receive, the better the reading. Angels do not violate free will. Sessions are conducted either in person, or by phone, facetime, or skype. Occasionally I can make time for an email reading if you only have a question or two. Sessions are usually 1/2-hour or 1-hour, although if you feel the need for more or less we can adjust. A half hour session is usually fine for a few major questions or several smaller ones. In an hour we can usually cover major life topics, smaller questions, and may even do some healing energy work if guided. Who do you work with in spirit? I tune into your angels, spirit guides, deceased loved ones (unless you’d rather not), pets, etc. I open up to whomever is coming in the spirit of love to help and assist you in living a happy, balanced life. I work frequently with Archangel Michael who assists a great many, and also Jesus for the pure love and healing energy He brings into the sessions. I do not impose any religious bias or personal opinions in my readings. If I share my own insights or feelings, I make sure you know it is coming from me and not Spirit. To prepare for your reading, set your intention and ask higher power, your angels and loved ones to help and assist you. They are always present, but they come in more strongly when the person receiving the reading is sincere in their desire to receive help. You can also make up a list of questions in case the angels don’t cover them automatically at the beginning of the reading – this way you won’t feel as if you have forgotten anything. It is not necessary to bring anything else other than an open mind and a willing heart. You can, but its not necessary. I can tune in from a first name only and sometimes even without that. Do you record readings? Can I record my session? Unless you’d prefer otherwise, your reading will be recorded and we’ll send you either a CD or an MP3 within a few business days. If you have an iPhone or other recording device that you would like to use, please feel free to bring it with you. What do I do if I lose my reading or forget to download it? If you lose or forget to download your reading please contact me. I keep them for one month on my hard drive, after which time I delete them to make room on my computer for new ones. Sometimes I am able to keep them a little longer. If you’d rather I delete the file immediately after you receive it, please let me know. Readings are strictly confidential. I only charge for readings that you feel satisfied with. My rates are currently $50/half hour or $100/hr. I accept most forms of payment in person. If you get a long distance reading, you can pay by check (contact me for details/address) or via our payment page here. The first time I taught someone to channel their guardian angel, we were both in awe. It was almost too easy. A woman came to me to learn shamanic journeying. Instead of the symbolic power animals, however, a beautiful blue angel showed up. We both saw him with our inner eyes. I gave up my previous agenda and guided her into a deep surrender. He moved into her, encompassing and embracing her. Her eyes filled with tears as waves of love radiated off this pure being and he began to share his love and wisdom with her. Since then I’ve guided hundreds of people to connect with their own guardian angels. Its fun. It’s easy. If I could learn to talk to angels, I know you can! 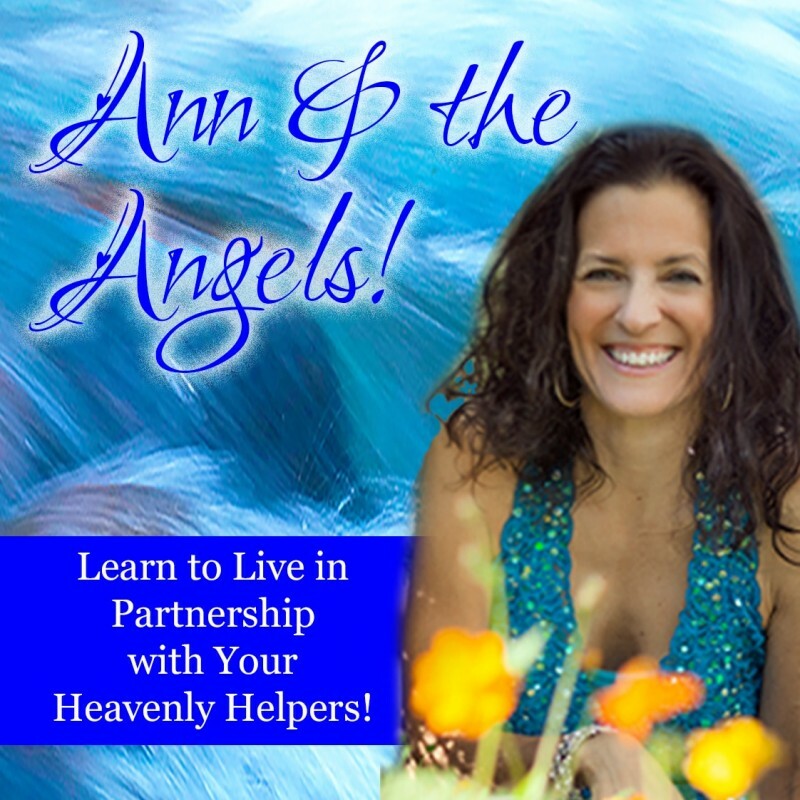 You can learn to live in partnership with your angels! Anyone can learn to talk to angels! In fact, your angels want to connect with you. Using simple, playful techniques, Ann will teach you how. Learn in the comfort of your own home! Watch online anytime, anywhere, with anyone, or enjoy Ann’s classes via CD or MP3 Download. In half an hour a week & just a few minutes a day you can transform your life by opening up to receive miraculous angelic assistance! Watch anytime, anywhere, with anyone. Learn at your pace. Review anytime! It’s easy! It’s fun! … and it’s available right now! Previous viewers have experienced amazing results! Recorded live in Sedona, AZ. Exercises are adapted for home use! 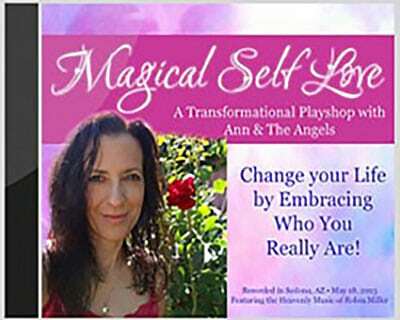 Dancing with Angels is one of Ann’s most popular live playshops. Now on CD or downloadable MP3, you’ll learn how to channel your angels, heal with your angels, and tune in to just about anyone or anything you like! Join us across space and time in this delightful playshop, recorded live in Sedona, Arizona. Enjoy hours of angel energy, information, and meditations, accompanied by the heavenly music of Robin Miller! Read what people say about Ann’s readings! “It is always so wonderful to see you! I just want to give you an extra special thanks for being so kind and patient today with the kids – you taking the time to listen to their questions and give such great guidance meant the world to all of us. I learn so much from these kids and am so thankful when I encounter others who also honor the kid in a kid and show them such respect. Thank you a million times over for a special day! – Lisa R.
“Ann, Thanks for helping my daughter yesterday! She went home last night, followed the angels’ advice, and baked cookies for the little ring leader bully at school. It made perfect sense to her and it went perfectly. I think it was a little reset button in that child’s brain because the bully didnt know what to think. After school she posted on facebook and thanked my daughter. Thanks again she seems much happier today.” – Linda A. “Last year I had a long distance private session with Ann. I have to say I was given a gift that day that I will always remember and forever treasure. Ann enlightened me with her friendly, fun style which I enjoyed tremendously. Additionally, Ann shared with me my father, who had recently passed. I felt as though I’d been touched by an angel. Ann truly is as much of an”angel ” as the angels who’s messages she’s sends out every week. I feel blessed to have been given such a beautiful gift.” – Carol M.
“Thank you ever so much Ann for the time spent today. My heart feels settled and I feel as though I now know which path to blaze! I am grateful that I was able to spend time with you. I’m so very grateful!” – Janice R.
“Just wanted you to know how uplifting, informative, and accurate your reading was that you gave me on Thursday. I came away with great clarity and joy. What a joyous gift you have – thank you for sharing it! You are a true earth angel!” – Lisa N.
“Because of your reading, I now believe, whereas before, I am not so sure I did. I guess I THOUGHT I did, but now I know. I know FOR SURE. I just need to thank you again for such a wonderful hour. You really did change my life. I love you, Ann. You have helped me so much.” – Jan M.
“Words can’t approach conveying… You, the angels and your reading changed my life forever yesterday. Eternally in gratitude.” – Cheryl S.
“I just wanted to thank you so much for the wonderful reading yesterday. You are so special and have such an amazing gift! My brother was so blown away with his reading and impressed by you, he has listened to his tape at least five or six times, it’s so cute. I feel very thankful and fortunate to have met you and gotten the chance to have readings by you.” – H.S. “I was blessed years ago to be able to have a session with Ann. Words cannot describe how empowering and uplifting Ann’s classes, personal sessions, cds and web site have impacted and changed my life. I will be forever grateful for having Ann in my life. I couldn’t be on this path without her help. Thank You Ann!” T. E.
“I wanted to thank you for you kindness toward my mother. You fit her in for a reading in December when we found out that she had terminal cancer. You also took the time to answer a couple of email questions that she had. My mom passed away yesterday morning thereby completing her life on earth and moving onto the next stage. I just wanted to say thank you. – Cameron R.
“I just got finished listening to the recording of our session and I just needed to stop and thank you again. The amount of time and angst that you have saved me is staggering to me when I think about it. I am able to let go of things that might otherwise haunt me for life, I gain clarity on people and situations that might take years for me to get to on my own, and thanks to you, I have my beloved father and horse back in my life in a way that I couldn’t otherwise. You defend me against my worst self-doubts, you give me a positive perspective on my life no one else has, and you patiently put up with my anxious ramblings (which makes me crazy to listen to when I play back the recordings—forgive me!). It occurs to me that it would be easy to assume that because you shed light on my life so easily and gracefully, that your own life must just be roses all the time, which of course can’t be true. I can only guess what it took for you to come to terms with your gift and the sense of isolation you might have felt along the way. Thank you for everything that you’ve been through, because of you my life is so much brighter and my load is that much lighter.” – Kate S.
“I can’t thank you enough. The reading was a beautiful experience and so very beneficial for me. You have an incredible spirit and gift. Thank you for sharing it with me. I hope to see you again soon.”– Diane B. “Thank you for your time today. I feel so much stronger just seeing you. Thanks to you and your gift I actually believe in myself now and my Life to get through this. I am hurt and sad but I understand what I must do to live a life of happiness. Thank you. I am blessed to have access to such a phenomenal person!” – Tammy P.
“I just want to thank you from the bottom of my heart for the session yesterday. You are an awesome person with an incredible gift, and your guidance meant more to me than I could ever describe! I couldn’t wait for my husband to get home yesterday to tell him all about it, and he was so happy to see me so happy! Also, being able to physically connect with my Mom was such a beautiful experience that I will never forget!” – Patty K.
“Hi Angel Ann, I can’t thank you enough for your session with me on Thursday. It was one of the most revealing, beautiful, comforting, sweet, loving, fun, wonderful experiences I’ve ever had. My goodness girl, how do you DO that??? Bless you for following your heart and for sharing your love and knowledge with all of us who are stumbling around out there, searching for the right path. I learned so much and feel truly blessed”. – Suzanne V.
“Hi Ann. I wanted to let you know how appreciative I am that you were able to fit me in and how beneficial I found our session to be. The messages from the angels concerning my marriage were more on target and helpful than the sessions I had with a therapist. Honestly! I really feel like I have closure now. You are a treasure. God bless you.” – Ted F.
“I had searched and search for my purpose” never expecting to ever figure it all out. Ann asked if I had a question and her answer was the one I had waited for after 5 degrees and lots of roads! Ann, thanks so much for your choice to serve.” – Donna J. “The hope and guidance that you have provided my wife and me over the years is an amazing and priceless gift for which we are so thankful. I am living the life you described to me several years ago (although at that time it seemed impossible) and I do feel truly blessed. Thank you, thank you… and we will raise you a thank you 🙂 God Bless You.” – Bernie M.
“Just wanted to comment on one of your recent readings. My cousin just got together with you this last Friday. She called me to let me know that you detected the presence of my late mother. From the message you gave her I just knew my Mom was in a better place and not suffering anymore from her cancer. The details you provided could have only been known by close family members. Thank you for your message, it really means alot to know my mother is doing just fine. I was with her when she passed and I felt very happy for her instead of sadness. I knew then that she was going to be just fine and that I would look forward to seeing her again someday. Thank you again for your gifted connection. – Paul K.
“Ann, you are an angel. I can’t thank you enough for making room in your schedule for me. I feel such enormous, deep gratitude to you. There really aren’t words to thank you enough for the gift you have given me. I don’t know how I can ever repay you. What you have given me is the most wonderful, priceless gift anyone could ask for. Thank you from the bottom of my heart. Many, many thanks and blessings.” – Barbara S.
“Thank you for the reading. You are an angel that brings peace to this earth!” – Ann S.
“I just wanted to take a moment and truly thank you for your time and energy yesterday. I appreciate your insight more than words can describe. Even just sitting there with you and sharing your positive angelic energy was amazing. You are truly an angel on earth and the work you do is awesome. Words cannot express my thanks but at least a scratched the surface : )” – Elisa K.
“Ann – I’ve been in a blissful state since our session Friday. Thank you again for your ever-present and always powerful support, guidance, and inspiration.” – Rick B. “Thank you. My life is so Blessed since I first met you. You were able to show me the way and God and his Angels have been so good to me. I cannot thank you enough for all that you have done for me. I was once lost and now I am found.” – Sylvia L.
“Thank you so much for taking the time to speak with me and my sister yesterday. I can’t tell you how much doing so, has helped us. We both felt amazing and even better today. We feel the release of the pain that we’ve been holding onto for over 6 months now. I believe you actually met my Dad, the love of my life and I feel so blessed to have gotten such loving messages from him yesterday. What you do, your gift….it’s priceless.” – Krissy B.